Pomegranate is a delicious fruit packed with edible seeds that have many benefits for your health. Consuming pomegranate seeds may also help improve your heart health, reduce pain and inflammation, and help improve digestion. Drinking pomegranate juice is also good if you have diabetes and to improve physical performance. Many of the health benefits of pomegranates come from the fact that they are packed with vitamins, minerals, and nutrients. Pomegranates also contain important antioxidants that help you resist infection and keep your brain healthy. Also, the anti-inflammatory effects of pomegranate can help protect you against chronic disease. In this article, you will learn about the many reasons why pomegranate juice and pomegranate seeds are good for you. The pomegranate (botanical name, Punica granatum) is a red-colored edible fruit that grows in the Middle East and in countries around the Mediterranean. The peel of pomegranates is too thick to be eaten. However, pomegranate peel extracts can be made into pomegranate powder and used for their antioxidant properties. To get the benefits of pomegranates, you can eat the seeds straight from the fruit or drink pomegranate juice. Pomegranate juice is a potent health drink that is extracted from the pomegranate arils. It is very easy to juice a pomegranate to enjoy a delicious healthy drink. Cut one pomegranate in half and gently knock out the pomegranate arils or seeds. Put all the removed seeds into a blender and blend until the seeds are broken up. Strain the liquid into a cup to obtain the pomegranate juice. If the pomegranate juice is too tart for you, you can sweeten it by adding a teaspoon of raw honey. Pomegranate seeds and juice are packed with nutrients that have many health benefits. Regularly consuming pomegranates can bolster your immune system because one cup of pomegranate seeds contains 9 mg of vitamin C which is 15% of your RDI. Pomegranate is also good for your blood and liver health because a whole pomegranate has 46 mcg of vitamin K which is 58% of your RDI. Pomegranate juice and pomegranate seeds also contain good amounts of vitamin E and many of the B-group vitamins. A glass of pomegranate juice (250g) also contains minerals such as calcium (3% RDI), potassium (15% RDI), manganese (12% RDI), and magnesium (4% RDI). The high number of antioxidants is one of the reasons why pomegranate juice is good for your heart, brain, and immune system. Pomegranates contain an impressive amount of vitamin C which is a natural antioxidant. Pomegranate is a nutrient-rich fruit that has many medicinal properties. Pomegranate juice and pomegranate seeds have therapeutic use in addressing a number of health issues. Ascorbic acid (vitamin C), tannins, and fatty acids in pomegranates all play a role in good health. Let’s look in more detail at the many benefits of consuming more pomegranate fruit in your diet. The potent effect of plant-based antioxidants (polyphenols) in pomegranate seeds and juice help to improve your cardiovascular function. Researchers have found that compounds such as tannins and anthocyanins have a powerful effect in reducing your risk of cardiovascular disease. One of the ways that consuming pomegranate juice improves your heart health is that it has an anti-hypertensive effect. Learn about other natural methods to treat hypertension without having to resort to medication. Pomegranate drinks can benefit your cardiovascular health because the juice can help lower levels of cholesterol. If you suffer from high cholesterol, you can find out about other natural remedies to help treat your condition. Pomegranate juice contains anti-inflammatory properties that can help improve your digestion. There are many more natural remedies to improve the digestive system that you can learn about. You can also find out how probiotics can boost your digestive system and immunity. The anti-inflammatory properties of pomegranate juice may help to protect you against various chronic diseases. Scientists point out that more research needs to be done into the effect of pomegranate in combating inflammatory diseases. Learn about other anti-inflammatory foods that can help reduce your risk of complications from chronic inflammation. Pomegranate fruit is good for you if you suffer from painful symptoms of osteoarthritis or rheumatoid arthritis. If you suffer from any form of arthritis, find out what other foods you should add to your diet to help cope with chronic pain. Consuming pomegranate juice can help to manage many of the symptoms associated with diabetes. Find out about other foods, not just pomegranates, which can help manage some of the symptoms of diabetes. Regularly consuming pomegranate juice helps your brain perform better and can protect against neurological diseases. Learn about other herbs and foods that can help to improve your cognitive performance. Pomegranate juice and extracts have the potential to protect against oxidative stress and improve cardiac function that helps to boost exercise endurance. Learn more about other natural ways to boost your energy and improve performance. The antimicrobial properties of pomegranate juice can help kill off germs and bacteria that lead to gum disease. Further reading: How to Get Rid of Gum Infection (Gingivitis) Naturally. 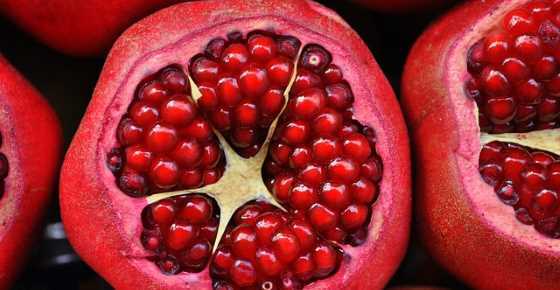 Pomegranate seeds can improve sperm quality and prevent erectile dysfunction. Learn about other natural ingredients that help improve the lifespan of sperm and increase fertility. Pomegranate juice and other pomegranate extracts have potential use in cancer treatment and in slowing down the progression of tumors. Pomegranate juice has antioxidant and anti-inflammatory effects that are useful in colorectal cancer and prostate cancer. Research into the effects of pomegranate seed oil on breast cancer has also shown positive results. Of course, more research needs to be carried out on how pomegranate juice and pomegranate seeds can be used in successfully treating cancer in humans. Learn about other foods for breast cancer prevention according to science. The best part of the pomegranate to eat are the delicious crimson arils or seeds contained in the fruit. The pomegranate arils are surrounded by a white pith which is bitter to taste. Pomegranate skin is too thick to consume, but you can dry the peel and then grind it to make a powder. To get the seeds out of a pomegranate, gently score the thick pomegranate skin around the middle of the fruit and split the fruit in half. Hold each half face down and gently tap on the skin with a wooden spoon to extract the delicious seeds. Just be careful when getting the seeds out as the red juice of pomegranate arils can stain fabric. You can eat pomegranate seeds fresh or you can store them in the freezer to consume at a later date. You can also boost your health by making a refreshing cup of pomegranate tea. Seoklyu-cha, or pomegranate tea, is popular in Korea for its health benefits. All you have to do is fill a cup ¼ full with fresh or frozen lightly crushed pomegranate seeds. Fill the cup with hot water, steep for a few minutes, add some honey to taste once it has cooled somewhat, and enjoy your health-boosting pomegranate tea. Don’t forget to eat the pomegranate seeds after you have finished your cup! Pomegranates are a delicious, healthy fruit that can be safely eaten in normal doses. Because pomegranate juice helps lower blood pressure, you should be careful when drinking pomegranate juice regularly. The juice may cause your blood pressure to become dangerously low if you already suffer from low blood pressure. Some people could have an allergic reaction to consuming pomegranate juice or pomegranate seeds. I am obliged to thank you for showing the benefit of pomegranate.But I would like to know how the pomegranate seed could be dried for daily use? Can it be dried under slow heat and kept in a glass jar? What about the skin of the pomegranate – can it be made as powder and used daily? Does 1 teaspoon of dried seed powder in the morning can clear the blocked arteries. I will appreciate your comments. I’ve never tried to dry the seeds as I usually consume them fresh together with the tasty arils. The medical studies about the benefits of pomegranate consumption for the arteries were about the juice (and not about the powder of the skin). Please see the section “Pomegranate Is Good for Your Heart Health”. You’ll notice that the studies were about pomegranate juice. I am sure that the peel has its own benefits but I don’t have a specific study about it in relation to the arteries. What amount of the juice do you recommend each day? Hi Ben, various studies used different amounts of pomegranate juice. The range was between 4 to 8 oz a day (120 to 240 ml). This is something like half cup to one cup.